In most sub-Sahara African countries, distance education is delivered using print materials complemented by a few face-to-face sessions. The approach is associated with a myriad of challenges some of which can be addressed by appropriately selected e-learning technologies based on the context in which they need to be used. This study was designed to understand the context of the Open University of Tanzania related to the use of e-learning technologies in distance education. A sample of 32 instructors and 208 students participated in the study. Both quantitative and qualitative data were collected. 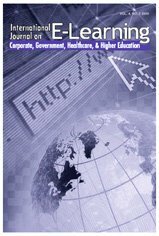 Results show that despite limited access to technologies, instructors and students (i) have positive perceptions about using e-learning technologies for distance education and support of students and (ii) have competences on basic computer and internet applications. It is argued that challenges related to narrow bandwidth, access, experiences and motivation of instructors to use e-learning technologies must be considered in deciding what technologies to use. Implications of the results for e-learning implementation, instructors’ professional development and student learning needs are discussed. Nihuka, K.A. & Voogt, J. (2011). Instructors and Students Competences, Perceptions and Access to E-learning Technologies: Implications for E-learning Implementation at the Open University of Tanzania. International Journal on E-Learning, 10 (1), 63-85. Waynesville, NC USA: Association for the Advancement of Computing in Education (AACE). Retrieved April 23, 2019 from https://www.learntechlib.org/primary/p/32413/.